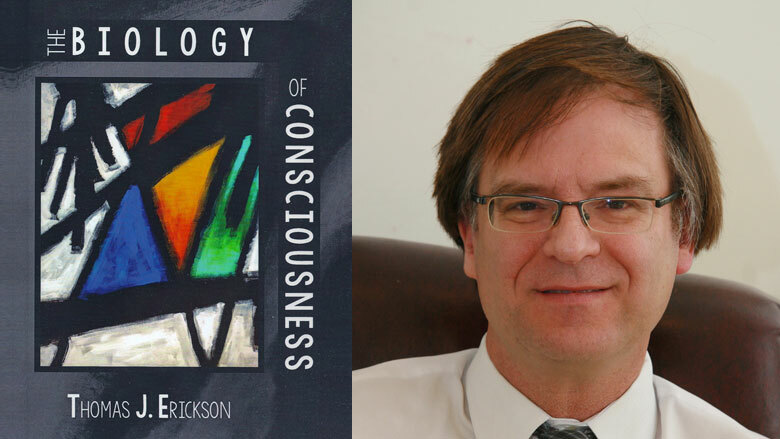 Thomas J. Erickson’s first full-length poetry collection, The Biology of Consciousness, stopped me dead in my tracks, even before I cracked the cover. What on earth could the book or its title poem mean? Various sources tell me this: while not understood, the biology of consciousness is a hot research subject and many new technologies are making it possible to more closely study the brain. Visual fields of reference may trigger electrical gamma waves that allow conscious—and perhaps unconscious—perception. Neurons, the brain’s electric energy-charging cells, may group together to form thoughts. Of course, philosophers have been arguing about the relationship between mind and body for centuries. So, what’s all of this got to do with poetry? A clue can be found in Erickson’s title poem, “I have not been in this house / before but to enter is to remember / how the capillaries connect / the dream from room to room.” Perhaps for Erickson, words can become neurons, and poetry the expression of consciousness. His division of the collection into three parts with differing themes reflects similar divisions of the human brain: the cerebrum is the center of perception, emotion, and memory; the cerebellum coordinates everyday tasks; the brain stem commands autonomous functions such as breathing and heart rate. In the first section, Erickson explores personal history. Early impressions—trout fishing with a grandfather, bird watching on a field trip in third grade, his time as an altar boy—become sometimes tender, sometimes edgy memories. In the second section, the strongest to my mind, he tosses his readers into a youthful, even dissolute, world of bar life and drinking, as well as Milwaukee’s dark side of violence and racial division. Erickson, a Milwaukee-based lawyer, shares his workload with us, including cases that can drain the soul. In “Sweating the Bottle,” he writes, “While we waited for the verdict, my client told / me he had molested the boys for years.” In “Phone,” he describes how everyday messages can be both sublime and grotesque, pedestrian and terrible, as in, “I read on my phone the court petition stating my teenaged client helped Smokey move the dead girl from the bathtub to the crawlspace and the Brewers are losing to the Cards 3 to 1 in the fifth.” It’s impossible not to come away from these poems shaken. Soon enough the roses will arrive and what will be said will be said. smiled over and then thrown away. Not so fast, I’d say. If Erickson’s poems aren’t meant to be uplifting, they are fierce and challenging as well as compassionate and graceful. Mercifully, they can also be ironic, even funny. Don’t miss this outstanding collection, to be read over and over again.